In the game manual of Touhou's Phantasmagoria of Flower View, Cirno, pitted as the second player character, was labeled as "⑨" - it stood for バカ ("baka" - "idiot"). Ever since, ⑨ gained notoriety as Cirno's nickname. 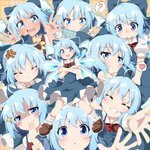 Not all Cirno posts should be tagged (9), only posts that incorporate the 9-in-a-circle symbol. The following tags are aliased to this tag: ⑨ (learn more).